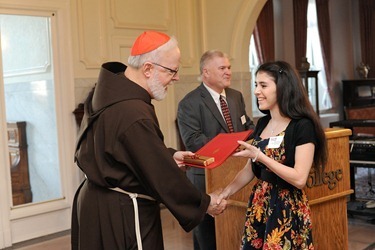 Right before I departed for Cuba to accompany the Holy Father on his trip there, I attended a gathering at Regis College as they awarded presidential scholarships to students from Catholic high schools in the Archdiocese. 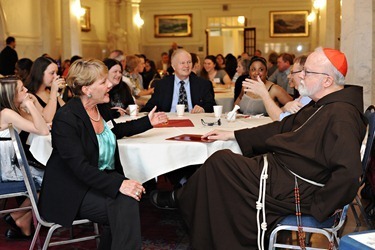 The scholarships were created four years ago to offer a possibility to Catholic school students to continue with their Catholic education through college. They have been very successful and I am very grateful to Regis College for it. 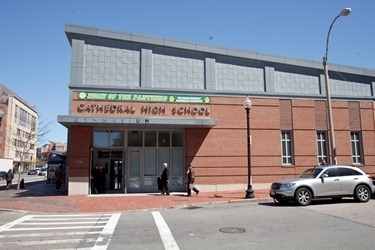 This year twenty-two students from high schools all over the Archdiocese received the scholarship, including students from Fontbonne Academy, St. Clement High School, Pope John XXIII, Mount St. Joseph Academy, Sacred Heart High School, Elizabeth Seton Academy, Cardinal Spellman High School, Lowell Catholic, Notre Dame Academy, Boston College High School, Matignon, Arlington Catholic, Mount Alvernia, St. Mary Regional and Bishop Guertin. Several other seniors at Catholic high schools outside the archdiocese received the scholarships as well. 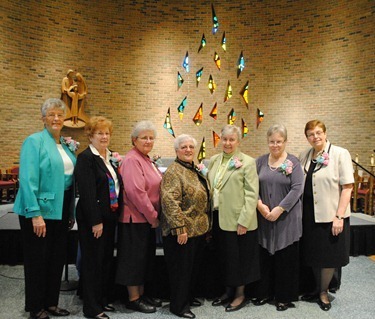 The following day I celebrated Mass for the Sisters of St. Joseph as they gathered in chapter to elect their new leadership team. 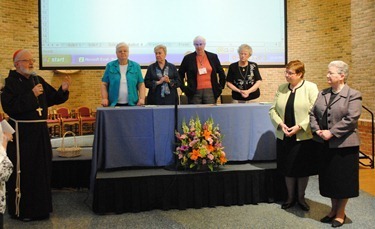 It was an opportunity for me to congratulate the new team and to thank their new president, Sister Rosemary Brennan, as well as to thank the outgoing president, Sister Mary Murphy, for her dedication. During my homily I thanked the sisters for their work in the archdiocese — they have served in many different capacities since they arrived in Boston in 1873 — and to express to them the love and appreciation of lay Catholics and priests for their presence and work among us. 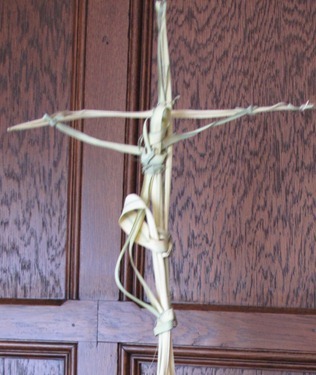 Palm Sunday, the initiation of Holy Week, this year was also the 800th anniversary of the profession of St. Clare of Assisi. 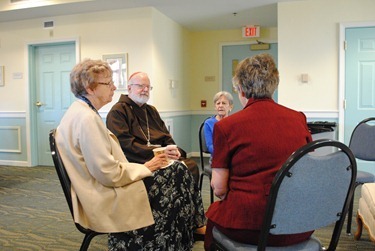 I would like to congratulate all of the Poor Clare Sisters, especially two convents that we have in the Archdiocese of Boston. 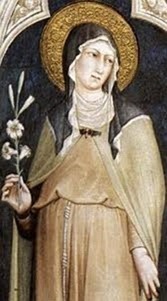 In the city of Assisi, Italy in the year 1212, the young noble woman Clare di Faverone di Offreduccio gave up her inheritance and all her worldly possessions to follow in the footsteps of Jesus through the example of St. Francis. 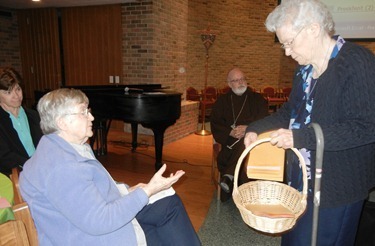 The Poor Clares in the Archdiocese of Boston continue that tradition. 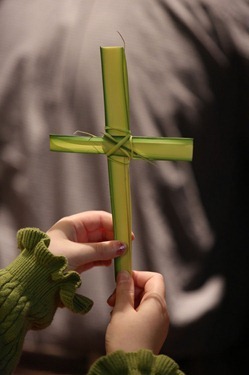 Every year I like to join a different parish for their celebration of Palm Sunday. This year’s celebration was held at St. Julia Parish in Weston, because they just finished the renovation of their sanctuary and I was there to dedicate the altar. 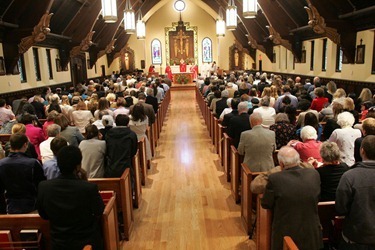 It is a very beautiful celebration that unfortunately very few Catholics are ever able to see because it is performed only when churches are opened, or when there is an occasional renovation. prefigured in those many altars of old. built an altar in your name. to a covenant refounded in love. and provided a ram for his offering. so prefiguring the altar of the cross. in his blood sin is engulfed. Lord, we therefore stand before you in prayer. where your people will find nourishment and strength. which ushered in the sacraments of the Church. and take up their journey restored. and grow in your life of love. to share your spirit of mutual love. we will offer you an everlasting sacrifice of praise. 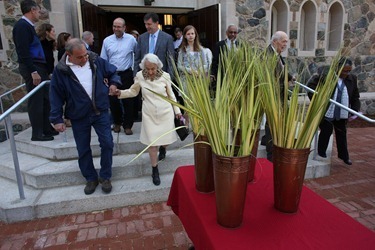 Palm Sunday is certainly a very popular feast, made clear by the fact that we have huge crowds coming to receive the palms. Lent itself begins on Ash Wednesday when we are signed with the ashes of the burnt palms from the year before, a reminder of how ephemeral many of the glories and the acclamation of this world are. Many of the same people who were shouting for Jesus as he entered Jerusalem, were the same ones who five days later would be shouting “Crucify Him! Give us Barabbas! We have no king but Caesar!” So the reading of the two Gospels are a very striking message about the meaning of Holy Week, and a preparation for the Sacred Triduum that comes later on in the week. 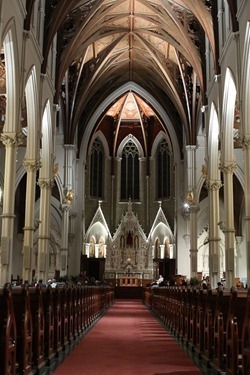 Father George P. Evans and his committee did an extraordinary job with the renovation. On the back wall of the sanctuary, they installed two stained glass windows that came from what originally had been an orphanage in North Cambridge run by the daughters of Charity. One window depicts St. Louise de Marillac and the other window depicts St. Agnes. They are very beautiful and bring a lot of light into the sanctuary. The altar, the ambo and the baptismal font are beautiful wood furnishings with the traditional Celtic Irish carvings on them. The sanctuary was also extended so there can be more room, which was a welcome improvement. 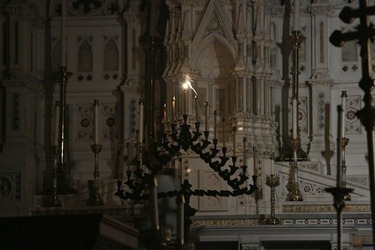 I have celebrated weddings there in the past and found the sanctuary small and very dark. Now that they have opened it up, there is more room. On the back wall they put the two windows. They are two beautiful windows. 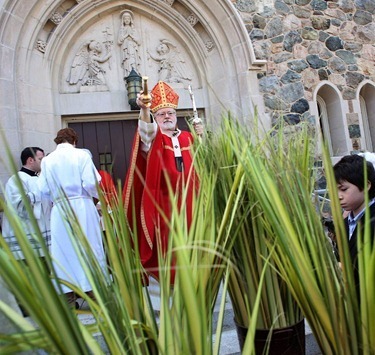 The Palm Sunday Mass begins with the blessing of the palms outside and the procession inside. They had been having Mass at the parish hall, so everyone was very happy that they could return to their church for Holy Week. So, it was truly a triumphant entrance of the whole parish into their church. Every Sunday we have vespers in the cathedral. 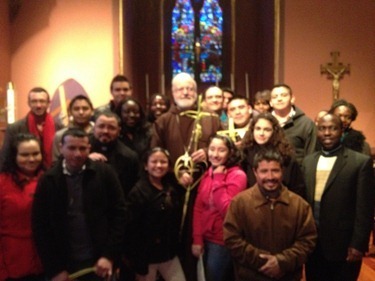 The Palm Sunday vespers was very well attended, including a group of young people that came with Father Michael Nolan from The Parish of St. Mary in Waltham. 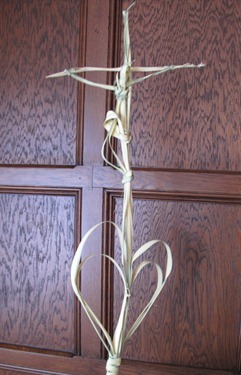 They brought me a crucifix made of palms. 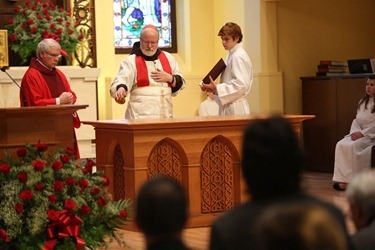 Tuesday was the Chrism Mass, one of the most important celebrations of the year. 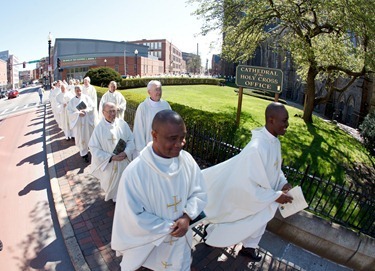 It really is a great celebration of the gift of the priesthood in the sacramental life of the Church. 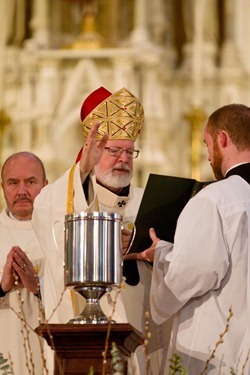 We gather bishops, priests, deacons, faithful and religious to bless the oils that are a sign of our unity. 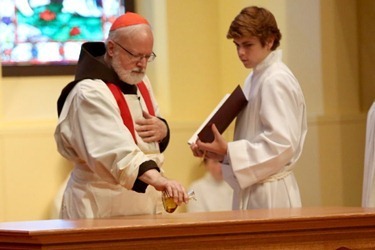 These oils are used throughout the year in all the baptisms, confirmations, ordinations, and anointings of the sick that take place within the archdiocese. 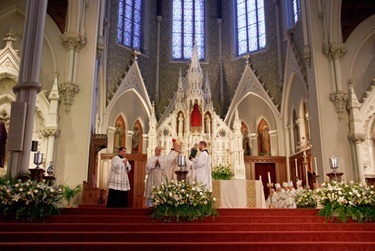 It is also the Mass where we priests renew our vows, a beautiful custom that was initiated by Pope Paul VI. We ask for the prayers of the people for their priests and their bishops. 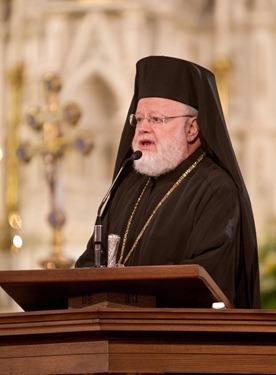 Each year at the start of the Mass I invite Metropolitan Methodios of the Greek Orthodox Church, who always attends our Chrism Mass, to address the priests and the people. He always has a beautiful message of solidarity and encouragement. 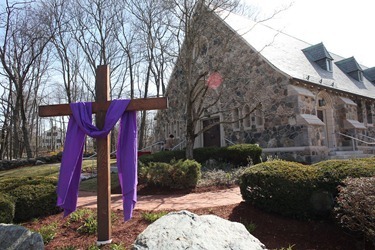 A week from Saturday, I will go to the Greek Orthodox Easter Vigil and then to our own Easter Vigil at the Cathedral of the Holy Cross with the Ethiopian community. Good morning everyone. Your eminence, Metropolitan Methodius, Brother Bishops and Priests, Deacons, Fellow Religious, dear brothers and sisters in the Lord. I first learned about the great tradition of Boston when John Wright became our bishop when I was a seminarian and he would regale us with many stories about Boston. But my favorite story of his was about Mayor Curley. Once when he was running for mayor, he was opposed by one of his lieutenants, a big, garrulous red-haired Irishman who I think was the police or the fire chief at the time. When his opponent had a political rally he decided to go. When he got there, he asked to speak. He said, “You know, every great man in history has had a betrayer. Caesar had his Brutus, Washington had Benedict Arnold, and our blessed savior had Judas. And you know? They were all redheads. Once I was visited by a priest who was very discouraged. He thought he was a redhead… He said: “Bishop, I am the worst priest in the world.” I said to him, that is quite a distinction. I asked him about his ordination and first mass. 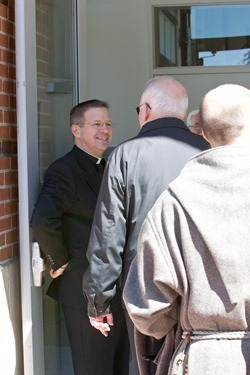 I said, “Did you fight over who was going to be first in line at your ordination? Did you betray Christ for a handful of money? Did you chop off someone’s ears with a machete? Did you then run away and hide? I was of course comparing the worst priest in the world with the first priests of the world, the apostles. The vocation of the apostles begins with the joyful discovery of Christ, and with the reckless abandoning of their boats, their nets and their families, to follow the Lord. It wasn’t too long however, when they were soon in competition with each other and worried about their retirement benefits, like who was going to have the thrones of the right and the left. 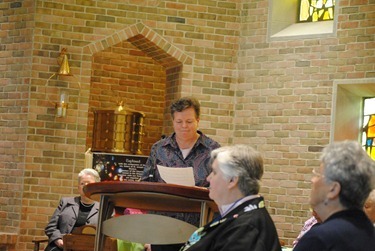 They spent most of the first Sacred Triduum locked in the Cenacle, while it was the women who followed Jesus through the Stations of the Cross and to Calvary. To me one of the most poignant scenes in the Gospels is the apparition of the Risen Christ on Easter to the 11 remaining apostles. They’re hiding out in the Cenacle with the doors bolted. Suddenly, Christ is in their midst showing them his wounded hands as if to say: “See how much I love you.” The reaction of the apostles certainly must have been one of very conflicted emotions. First of all, they were overjoyed to see that Jesus was alive and in their midst. Secondly, they would have felt a profound shame and embarrassment because of their cowardly behavior. The apostles did not surface even to bury Jesus’ body after the crucifixion. Had it not been for Nicodemus and Joseph of Arimathea, Jesus’ body would have been cast into a common ditch to be savaged by vultures and dogs. But Jesus’ love and forgiveness is so great, He does not even remind them of how badly they have behaved, but instead gives them the gift of the Spirit so that these sinners could become wounded healers. I find immense consolation in the fact that the Gospels give us, not pious platitudes, but a gritty, realistic portrayal of our first priests, the apostles. They were ordinary men like ourselves, full of humanity and shortcomings and idiosyncrasies. They were entrusted however, to carry on the most important mission in the history of the world and despite all of their weaknesses, they did an extraordinary job. I’m sure that all of us at one point have felt a certain envy of the apostles. We imagine how wonderful it would be to be there and hear Jesus’ voice, to see his miracles, to experience the closeness, the companionship and joy of being in his presence. It is ironic however, that the apostles’ worst behavior came about while Jesus was still with them. They came into their own after the Pentecost experience. It’s then that they go out boldly to proclaim the gospel and to share with the world what they have received. Though we have not had the privilege of walking over the hills of Galilee in Jesus’ company, we have received the same Spirit that the apostles did on Holy Thursday, on Easter Sunday and on Pentecost. And now the mission must continue, despite our weaknesses and shortcomings and all obstacles. Christ is counting on us just as He counted on those simple fishermen to preach his gospel, calling people to conversion and discipleship, building a community of faith around the Eucharist. Like those first Christians in the Acts of the Apostles, we must be united in embracing the teachings of the apostles, fellowship and prayer, and the breaking of the bread. 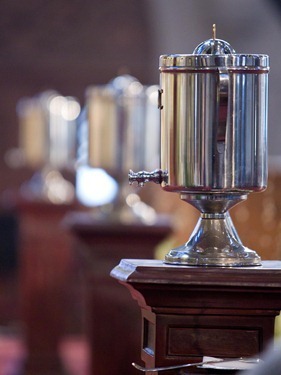 Holy Thursday is a very special day for us priests; indeed this very Chrism Mass is an extension of Holy Thursday. On that first Holy Thursday, Jesus washed the feet of his apostles and commanded them to love one another in the way that He loves us. 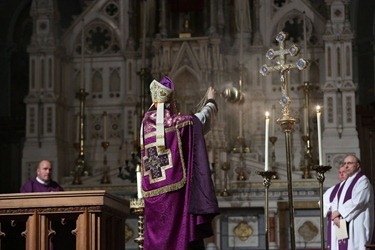 He also commanded them to celebrate the Eucharist, “Do this in memory of me.” And later on that same evening, Jesus tells his first priests: “Watch and pray.” Today, 2,000 years later, Jesus is telling us the same thing: we must love one another, we must celebrate His Eucharist, and we must watch and pray. In Chapter 14 of the Acts of the Apostles, St. Luke reports how Paul and Barnabas gather the faithful at Antioch and they reported what God had done with them and how God had “opened the door of faith to the Gentiles.” Pope Benedict has lifted that beautiful phrase, “the door of faith,” “Porta Fidei,” for the name and theme of his letter announcing the year of faith beginning in the fall. It will mark the 50th Anniversary of the opening of the second Vatican Council, convoked by Blessed Pope John XXIII, and which also coincides with the 20th anniversary of the promulgation of the Catechism of the Catholic Church, published by Blessed John Paul II. We are people of faith. Faith defines our identity and motivates our actions. Faith is our most precious gift. I am so grateful to have been born into a family of believers, the faith and example of my parents and grandparents and aunts and uncles was so life giving to me as child. And I am ever grateful to my uncle, Father Jerry Riedy, who baptized me into the faith. Preparing these reflections today, I decided to consult my concordance of the Bible. I found that the word faith appears four times in the Old Testament. However, in the New Testament, which is much shorter, the term faith appears over 250 times and the word believe also appears over 250 times. It is impossible to read the New Testament without appreciating how important faith is. Faith means not being an orphan, having a father who is our God and having many brothers and sisters. Faith is a home where we dwell and move and have our being, where we discover how much we are loved and who we are. Faith is a relationship with Christ, a loving and trusting and enduring friendship. Indeed the mission entrusted by Jesus to the apostles is not first of all to announce the gospel, but first of all to believe in him. 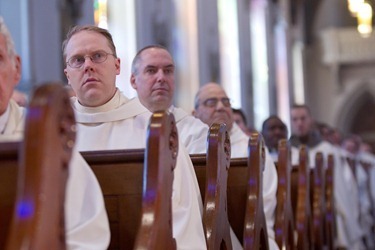 As priests we are called to be men of faith, teachers of faith and witnesses of faith. A few weeks ago I was invited to give the opening talk at a retreat for 75 young Jesuits here in Boston. A Jesuit Father who is a missionary in Siberia had organized the retreat and invited me. Afterwards, he presented me with a beautiful Russian icon of Our Lady. He told me that in Russia it is said: You do not choose the icon, the icon chooses you.” A very interesting perspective. Well, faith is born of a glance. Not so much ours, but that of Christ. The account of the vocation of the Apostles begins by the assertion Jesus looking at them. Jesus saw Andrew and Peter. Jesus saw the sons of Zebedee. Jesus saw Matthew. And having seen them, having fixed his gaze upon them, Jesus calls them to a life of discipleship. We should ask ourselves: “when did we become aware that Jesus had set his eyes on us?” When did we recognize His voice, and His invitation – “Follow me.” Each of us has our own vocational story. 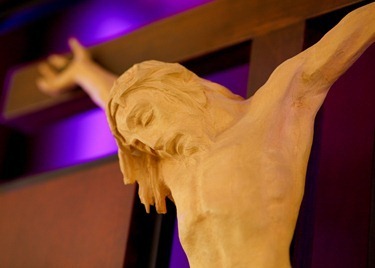 For each of us, there is a precise moment for each of us where we became aware that Jesus was looking at us. Certainly, there were many other moments: moments of enthusiasm, moments of definitive choice, and moments of decision to renew ourselves in the face of trials and difficulties and trials in our ministry. Even moments of remorse and shame when we had to cast ourselves on the mystery of our Lord’s mercy, like Peter in the courtyard of the high priest, when the Lord turns and fixes his gaze on Peter, who goes out and weeps bitterly. To be under the gaze of the love and mercy of Jesus and to put our eyes fixed on Him, this is faith and from that faith comes every call, every following and even our ministerial vocation which unites us to Jesus who with love, compassion and tenderness sees the crowd and is moved because they are like sheep without a shepherd. Seeing our people’s needs, Jesus sends us. Indeed as priests, we must persevere in running this course with our gaze fixed on Jesus, the origin and crown of all faith. It is our own Boston Marathon with many a Heartbreak Hill. It is a long distance run, not the frenetic sprint of the person anxious to be everywhere, who feels indispensable, who never has time for smile, who is not capable of listening, and who does not have the capacity for a profound silence. We need to witness the faith not by adopting the rhythms and times of this world, but rather by responding to the urgency of the gospel. “Faith comes through hearing” (Romans 10, 17) and it is as men of faith, that we must build our lives on the Word of God. There are so many demands on our time and attention, and our energy is not limitless. It requires discipline in the organization of our time to guarantee that each day we can be nourished by listening to the Word of God. Our celebration of the liturgy is also a crucial contact with the power that comes from God’s Word and from the Sacraments. Regardless of what one may feel about the new translation, the changes in the liturgy have been an opportunity for us to focus with greater attention to the words we are praying. 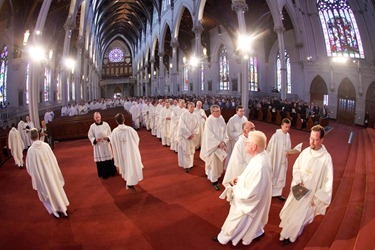 The Chrism Mass allows us to glimpse the grace of belonging to a presbyterate. It is this in this presbyterate, united to Christ and one another that the gifts that we received by the imposition of hands can be stirred up and enlivened. Here all of our struggles and triumphs are melded into one. 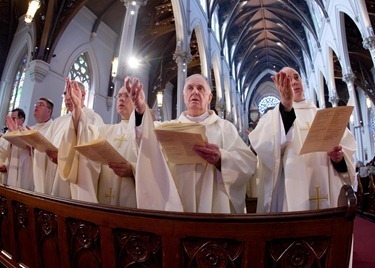 The hidden sacrifices heroically made by some of our brothers, the special graces, the pastoral genius, the tireless dedication come together to forge our presbyterate. We are a body that together regenerates itself. Together we share the responsibility to announce the Gospel and to build up the Christian community. You often hear the expression: “keep the faith.” But what we really need to do is not keep the faith, but spread it around. Our faith grows stronger when we share it with others. All of us remember fondly the priests who mentored us in the faith. Now it is our turn to share these treasures. We are earthen vessels bearing treasures. The world is being overcome with darkness. To me one of the most chilling phrases on Jesus’ lips are the words: “When the Son of Man returns will he find any faith on the earth?” In great part it depends on us. We who are Christ’s priests have a huge responsibility to announce his Gospel in season and out of season. I often tell the Jesuits that I’m a little envious of them, since they have 35 craters on the moon named after Jesuit fathers. 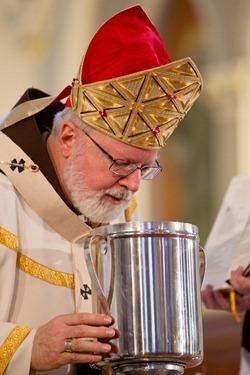 We Capuchins only have a cup of coffee…. One of the best spots to drink a good cappuccino is the Piazza of San Eustachio in Rome. If you have ever indulged yourself at one of the cafés there, you may have noticed the lovely church which looks like many other Italianate churches, except for the fact that on top of the church where one usually expects to find the cross, there is a huge set of antlers. I am sure that there is some pious explanation for the antlers, perhaps some story about San Eustachio running over a deer and miraculously providing venison for 4000 orphans. However, if you ask the Romans why there are antlers on the top of the church you may hear the story that I was told. Apparently, a young Roman nobleman married a beautiful bride in that church, but soon after the marriage she absconded with the best man. Today the man would have gone on the Jerry Springer show. The husband was disconsolate, and in his grief and rage had the antlers placed on the roof of that church. In Italian, a man who has deceived by his wife is referred to as “cornuto” which means having horns. I am told that ever since the antlers went up, there are very few weddings in that church. Accordingly, for many Romans, the antlers on the church betoken defeat and sadness. During this year of faith we need to climb up and pull the antlers down and lift high the cross, the triumphant, life giving cross. Our people need us to be confident and joyful teachers of the faith. 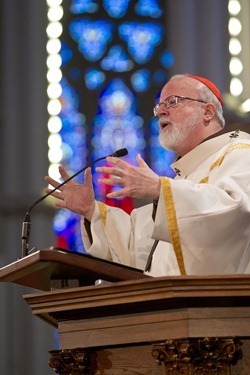 Cardinal Dolan spoke of going to a conference by Cardinal Wright on Evangelization, expecting a deep theological treatise. The message of the eloquent Bostonian was simply – smile! Pope Benedict constantly dwells on relationship of faith with joy. The word joy appears sixty (60) times in the New Testament. The very word Gospel means glad tidings. We are messengers of that joyful news. 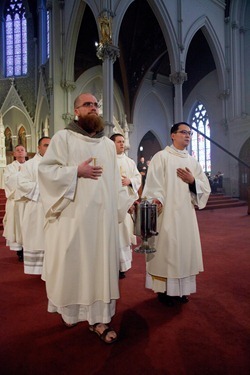 At the Chrism Mass, I like to make an appeal, a challenge to my priests and to myself. In the past, I have asked us all to work harder on our preaching. 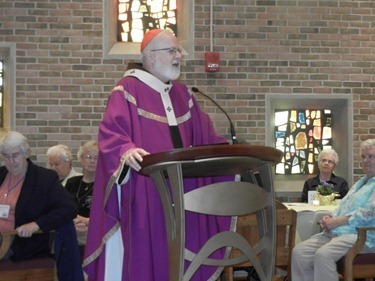 I have asked that every priest make a serious retreat each year – I had to go down to St. Petersburg last year to make sure Bishop Hennessey was not offering the enneagram and reiki. Actually we are very grateful for the wonderful work Bob Hennessey is doing on those retreats. I have asked that each priest develop a personal rule of life to assure the balance we need to pray hard, work hard and play hard. 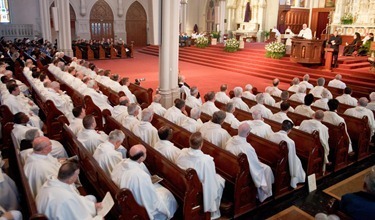 I have asked that each priest join a priest support group to be able to build a truly spiritual fraternity with a deep sense of shared mission. 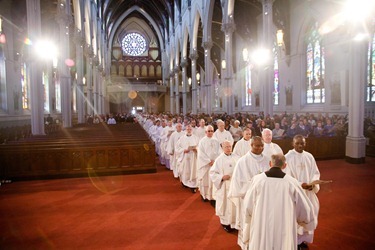 This year I would ask that each priest, myself included, to recommit ourselves to our own ongoing formation. Each of us is ultimately responsible for his own ongoing formation, which needs to be spiritual, human, theological and pastoral so that we might be the teachers of the faith our people need. Pope John Paul II wrote in Pastores dabo Vobis: “Ongoing formation aims at increasing the priest’s awareness of his share in the Church’s saving mission”. 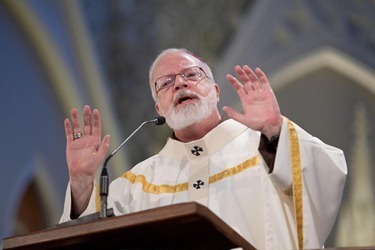 “The priest’s permanent formation appears not only as a necessary condition but also as an indispensable means for constantly refocusing on the meaning of his mission and for ensuring that he is carrying it out with fidelity and generosity. By this formation, the priest is helped to become aware of the seriousness and yet the splendid grace of an obligation which cannot let him rest, so that, like Paul, he must be able to say: “If I preach the Gospel, that gives me no ground for boasting. Woe to me if I do not preach the Gospel”(1 Cor. 9:16). At the same time, the priest also becomes aware of a demand, which insistently comes from all those whom God is unceasingly calling to salvation. 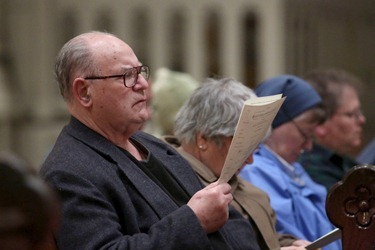 For the Church, the Year of the Faith is to be the year of the New Evangelization. 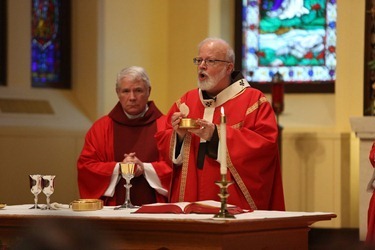 Our personal ongoing formation will help us as a diocese in our task of imbuing our pastoral planning with the new evangelization which means taking the Gospel to those who have grown cold, to reach out with a new ardor and with new methods, turning our parishes into communities of evangelizers where every parishioner feels a call to share their faith, to be a part of the mission to make Christ’s Gospel loved, and to promote a civilization of justice and love. I am very grateful to Bishop Arthur Kennedy for his willingness to help us to equip our people for the challenges of the New Evangelization and for promoting our ongoing formation. I know that it seems daunting but I am confident that this Year of Faith will be great grace for our Church if we priests take advantage of this time to renew ourselves in an ongoing conversion that is a response to Christ’s loving call. Spiritual writers speak of a second call, actually there are many moments when the Lord glances at us as He did to Peter, after Peter’s fall and what I call the “Last Breakfast” when the risen Lord, having examined Peter in his love, says “Follow me” again. As we renew our ordination promises may we recommit our lives to Christ, to our brothers and sisters, in the service of the Gospel whose Heralds we are. May the Lord grant each of us a faith that bestows confidence and courage, generosity and joy, as together we work to build up Christ’s Kingdom. Together we want to take down the antlers of sadness and defeat and weathervane of doubt and uncertainly and lift high the cross. What St. Francis calls the book that contains the greatest love story in the history of the world – and we priests are all part of that story. God bless you. 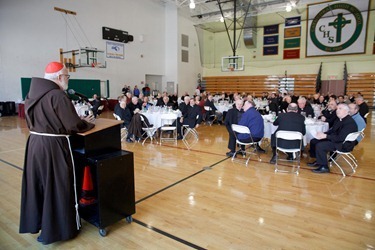 Each year, after the Chrism Mass, we hold a luncheon for the priests and deacons to continue the sense of fraternity fostered by the Mass. It is always a wonderful opportunity to be together. 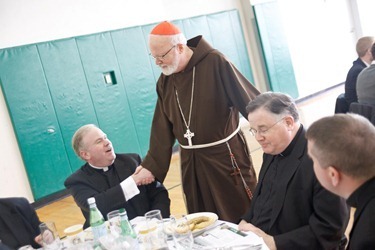 During the luncheon we honor two of our brother priests for their service and commitment. 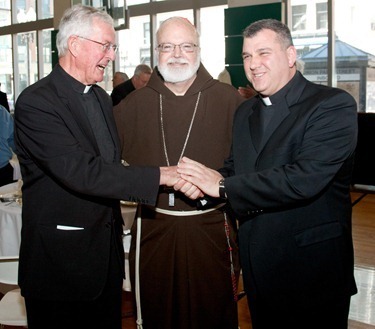 This year, we honored Father Jim Rafferty and Father Lou Palmieri. We congratulate Father Jim and Father Lou and thank all our priests for their faith and ministry. The instructions on the liturgy call for the Liturgy of the Hours to be celebrated in the cathedral. As I mentioned we have the vespers every Sunday, but on Wednesday of Holy Week we also have Tenebrae, which is a service based on the Matins and Lauds anticipating Holy Thursday. 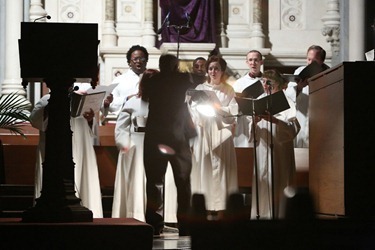 It includes very beautiful responsories and lamentations that are sung. During the recitation of the psalms and the lessons, candles are extinguished one-by-one until, finally, there is only the Christ candle left. 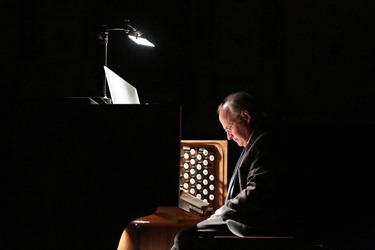 It ends with the strepitus, a deep roar made by the organ symbolizing the earthquake of Good Friday. It was a good crowd of a couple of hundred people participating. 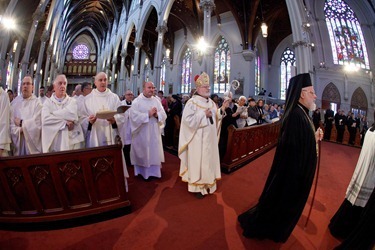 This year, I invited Father Joe Baggetta of St. James the Greater in Boston to preach at the service. 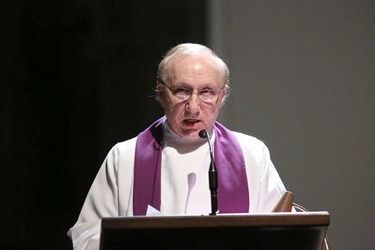 He he gave an excellent homily. The service is such a fine way to anticipate the Triduum. These are the Holiest days of the year, so we would like to encourage everyone to pray for our new Catholics being received into the Church on Holy Saturday. I also urge as many Catholics as possible to participate in the Easter Vigil. 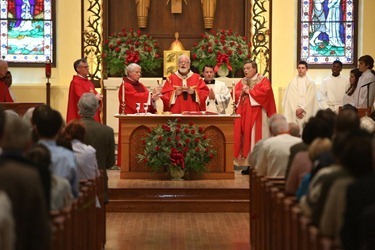 It is not a short service, but it is the most important liturgy of the year!